Alarming trends are showing the danger of climate change. The Earth is approaching a tipping point, climate scientists say, and we are beginning to see the consequences of unsustainable environmental practices. Higher education institutions have a responsibility to drive solutions, including reducing the release of greenhouse gasses into the atmosphere, considered a major cause of climate change. Continuing its leadership in sustainability, Wilfrid Laurier University is implementing a five-year plan to reduce greenhouse gas emissions and embed sustainability into every aspect of campus life. 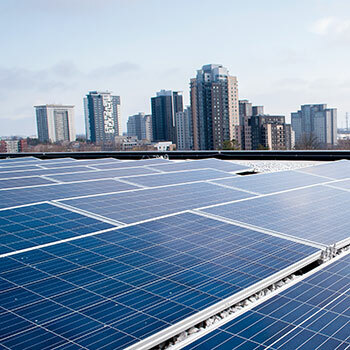 Laurier’s new Sustainability Action Plan offers a comprehensive outline of goals both big and small, from reducing greenhouse gas emissions by 15% by 2022 to including electric vehicles in campus fleets and increasing access to local food on campus. Laurier’s Sustainability Action Plan outlines steps to continue building a culture of sustainability through academics, research, operations, outreach and community partnerships. Laurier’s Strategic Academic Plan and Campus Master Plan provided context for the Sustainability Action Plan and will guide in its implementation. The United Nations Sustainable Development Goals were also used as a framework. Develop a fossil fuel free impact investing endowment fund available to university donors. Laurier will develop an ambitious Carbon Reduction Roadmap throughout 2019. Combined, the Sustainability Action Plan and Carbon Reduction Roadmap will outline Laurier’s short-, medium- and long-term greenhouse gas emission reduction targets and strategies to meet Laurier’s overarching sustainability goal: reduce emissions by 40% by 2030 and achieve a carbon neutral campus and sustainable energy resiliency by 2050. Sustainable energy resiliency means maintaining a secure supply of sustainable energy for university operations. With sustainability champions already engaged across Laurier’s campuses, transforming learning environments and behaviours is the next step, according to the Sustainability Action Plan.